Carbon dioxide (CO2) is the principal gas that trees and other plants need to survive, just like oxygen (O2) is the principal gas that humans and other animals require. Trees absorb CO2 and release O2 — animals inhale O2 and exhale CO2. See how nice this all works! Earth’s first, primitive forests made their prolific debut 300 million years ago during the Carboniferous Period. Before then, the atmosphere held far more CO2 but concentrations declined throughout the Carboniferous Period as plants flourished. During the Carboniferous Period the atmosphere became greatly depleted of CO2 (declining from about 2500 ppm to 350 ppm) so that by the end of the Carboniferous the CO2-impoverished atmosphere was less favorable to plant life and plant growth slowed dramatically. Today, CO2 concentrations are barely at 380 ppm — still CO2-impoverished. Many scientists strongly believe that we should be trying to produce more CO2, not less. And for good reason. Did you know that many farmers operate machines which produce CO2 in their greenhouses to encourage plant growth? Carbon dioxide (CO2) is not to be confused with its poisonous evil cousin carbon monoxide (CO), which can kill humans and animals in just a few minutes. Life as we know it could not exist without carbon DIOXIDE in our atmosphere. Did you also know that Carbon dioxide is actually invisible? The puffs of clouds you see from coal-fired power plants are just that — clouds. Power plants use steam to drive the turbines which generate electricity. Steam must be cooled and condensed to water to reuse it to make more steam. The fat, curvy towers that look like they are belching white smoke are really only emitting pure water vapor. They are in effect making clouds. The actual exhaust emissions come from the smokestack, which is the tall skinny tower. Because modern technology makes it possible to remove much of the fly ash and sulfur before releasing smokestack gases to the air, smokestack emissons today are often almost invisible. In the last 600 million years of Earth’s history only the Carboniferous Period and our present age, the Quaternary Period, have witnessed CO2 levels less than 400 ppm, except during periods of glacial expansion during ice ages. The Carboniferous Period and the Ordovician Period were the only geological periods during the Paleozoic Era when global temperatures were as low as they are today. To the consternation of global warming proponents, the Late Ordovician Period was also an Ice Age while at the same time CO2 concentrations then were nearly 12 times higher than today — 4400 ppm. According to the greenhouse theory you hear from the alarmists, Earth should have been exceedingly hot. Instead, when CO2 levels were at their highest, global temperatures were no warmer than today or often lower. 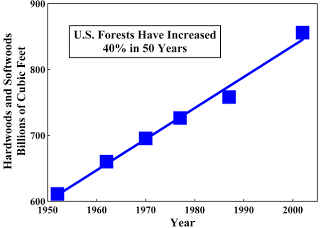 Thanks to just the small amount of human-produced CO2 in modern times, forests and plant life has greatly benefitted. Remember that fact the next time you drive your car to work and feel “guilty”. It is completely unfounded guilt, stamped into your head by the media and Big Environment propaganda. Every vehicle made in the last 30 years is equipped with a catalytic converter which converts harmful pollutants such as CO into NON-harmful CO2 and water vapour. As atmospheric CO2 increases, plant growth rates increase. Also, leaves transpire less and lose less water as CO2 increases, so that plants are able to grow under drier conditions. Animal life, which depends upon plant life for food, increases proportionally. 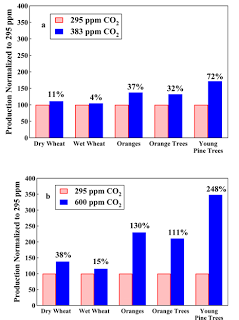 Wheat growth is also accelerated by increased atmospheric CO2. Clearly, the green revolution in agriculture has already benefitted from CO2 fertilization, and benefits in the future will be even greater. Animal life is increasing proportionally, as shown by studies of 51 terrestrial and 22 aquatic ecosystems. Moreover, as shown by a study of 94 terrestrial ecosystems on all continents except Antarctica, species richness – biodiversity – is more positively correlated with productivity – the total quantity of plant life per acre – than with anything else. Atmospheric CO2 is required for life by both plants and animals. It is the sole source of carbon in all of the protein, carbohydrate, fat, and other organic molecules of which living things are constructed. Plants extract carbon from atmospheric CO2 and are thereby fertilized. Animals obtain their carbon from plants. Without atmospheric CO2, none of the life we see on Earth would exist. Water, oxygen, and carbon dioxide are the three most important substances that make life possible. They are surely not environmental pollutants. Please visit www.CO2Science.org for even more information about wonderful CO2. The facts must be told before Obama & Gore pull the wool over our eyes. Anthropegenic Global Warming (AGW) and the climate change myth is one of the biggest hoaxes ever perpetuated onto the general public, created by environmental extremists and supported by governments who wish to enact their political, social, and economic agendas. The main argument used by these alarmists is that CO2 emissions will cause catastrophic global warming. There is absolutely no science that substantiates such claims, period. Global warming is something that has been happening for a long time. The temperature of the Earth has been increasing more or less continuously since the time of the cave man. Approximately 18,000 years ago the Earth began a gradual process of warming up after more than 100,000 years of Ice Ages. Much of North America, Europe, and Asia lay buried beneath great sheets of glacial ice. By about 15,000 years ago the Earth had warmed sufficiently to halt the advance of glaciers, and sea levels worldwide began to rise. By 8,000 years ago the land bridge across the Bering Strait was drowned, cutting off the migration of men and animals to North America. Since the end of the Ice Age, Earth’s temperature has risen approximately 16 degrees F and sea levels have risen a total of 300 feet! Forests have returned where once there was only ice. From a geological perspective, global warming is the normal state of our accustomed natural world. Technically, we are in an “interglacial phase,” or between ice ages. The question is not really if an ice age will return, but when. Don’t panic when you hear global alarmists warning the Earth may have warmed almost 1 degree in the last 200 years. Although this still hasn’t yet been proven, it is in fact exactly what should be happening if everything is normal. And to put the icing on the cake, it is well proven that currently the Earth has been cooling for over a decade now. It’s cooling you should be worried about, as a colder world negatively impacts all life. Please visit our RESOURCES page for a comprehensive list of links to information on climate change.